The VFC Linear flow control adjusts volumes of gas and cold air on various appliances. 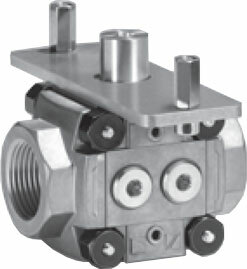 Mount with IC 20 actuators or IC 40 actuators for regulating flow rates for control ratios up to 25:1 in modulating or stage-controlled combustion processes. Linear flow control VFC and actuator IC can be supplied separately or assembled.